Toronto Dogs Directory: Let's Talk About Doggy Diarrhea! Let's Talk About Doggy Diarrhea! When it comes to diarrhea in dogs, the first thing we think is how we can get rid of it as soon as possible. It is important to find out why your dog may have diarrhea. It could be as simple as something he ate, a recent vaccination or simply a little too much excitement. Once you have determined the cause of your dog’s diarrhea, it’s time to start treating it right away. Often times, diarrhea does not need to be treated with medication, unless it contains blood or other severe symptoms. 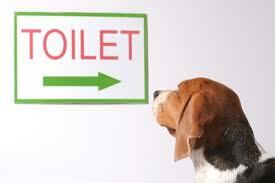 There are many home remedies available to help treat diarrhea in dogs at home. Diet. Take away all food during the first 24 hours of diarrhea. Make sure he has plenty of water available, as diarrhea can cause dehydration. After the 24 hour fast, you can give your dog a bland meal. Some foods to consider are white rice, boiled hamburger or chicken, and cooked oatmeal. After a few days, you can go back your dog’s regular food. Exercise. The nervous system responsible for maintaining normal digestion may be stimulated by a bit of exercise. As long as your dog is willing, try to take him for a couple short walks during the time he has diarrhea. Supplements. There are a few vitamins and herbs you can give to your dog to help support his digestive system. Some of these include L-Glutamine, licorice, slippery elm and enzymes. There are steps to take to help prevent diarrhea at all costs. Sometimes it is simply unavoidable, but there are tips to help keep your dog’s tummy healthy and keep the mess away. - Have puppies vaccinated as soon as possible to avoid bacteria and worms from growing. Puppies should always be kept away from other animals that may not have been vaccinated. - Check your yard regularly for spoiled tree fruits or dead animals. Dogs are natural scavengers and will, unfortunately, hunt out and chew on dead carcasses. Not only can dead animals cause diarrhea, but other serious illnesses as well. - Avoid feeding your dog any fatty, spoiled or sugary human foods. Yes, we all give our dogs “people food” every once in awhile, but it should not be a regular event. Be aware of chocolate and diary, as they can cause serious digestive problems as well as diarrhea. - Make sure your dog’s diet is well balanced and regular. Constantly changing your dog’s food will give him an unbalanced digestion and may cause diarrhea. - Keep an eye out for sharp or broken toys/foreign objects. This may cause tearing in the digestive tract, and will likely cause bloody diarrhea. To avoid this, only give your dog toys meant for dogs. Treatment of diarrhea can be a bit of a task. Observing your dog’s behavior is the first step to determine whether or not you can treat his diarrhea problem at home, or if he needs to be taken to the veterinarian as an emergency situation.